The concept artist for Aardman film The Pirates! In An Adventure With Scientists, has been named winner of the Waterstones Children's Book Prize. 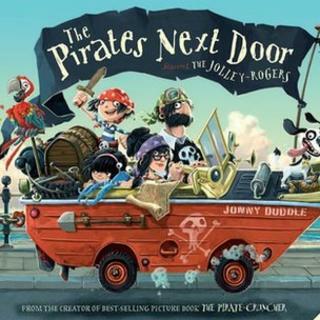 Jonny Duddle's The Pirates Next Door is about a family of pirates who move to the quiet seaside town, Dull-On-Sea. Duddle picked up the £3,000 award on the same day the British animation, starring Hugh Grant and Salma Hayek, was released in cinemas. The title was also named best picture book, winning him an additional £2,000. Duddle beat off competition from the other category winners to take home the coveted top prize. Liz Pichon's The Brilliant World of Tom Gates was named the winner of the best fiction award for children aged five-12 and Jenny Downham picked up the best book for teenagers' gong for Against Me. Both authors received £2,000 for their achievements at the ceremony in London. The Pirates Next Door is Duddle's second picture book, following The Pirate Cruncher. Melissa Cox, who is the children's book buyer for Waterstones, said: "The Pirates Next Door is full of the anarchic wit and invention children love in a picture book. "It's fresh and fun and has been a huge hit in Waterstones' shops across the country, and had an incredible reception from booksellers, parents and, most importantly, children." "Jonny is a huge new talent in the picture book field." Organisers said the award "celebrates new and emerging talent in children's writing".